Since the iPhone 8/8 Plus has been issued,some users awfully enjoy its high intelligence.The faster CPU, efficient battery utilization, a Gorgeous retina hd displaym, wireless charging function and so on ,all of those bring more new and interesting experience for users, as well as convenience. It’s too common to mention that some users prefer to back up data to iCloud ,in the case of losing or exposing some vital data accidentally.I think it’s a great and necessary behavior. Nevertheless,it seems that it’s easy to back up data but a bit of troublesome to transfer data from iCloud Backups to Mobile Phone, such as iPhone 8/8 Plus. However,there is a good solution.You know what? 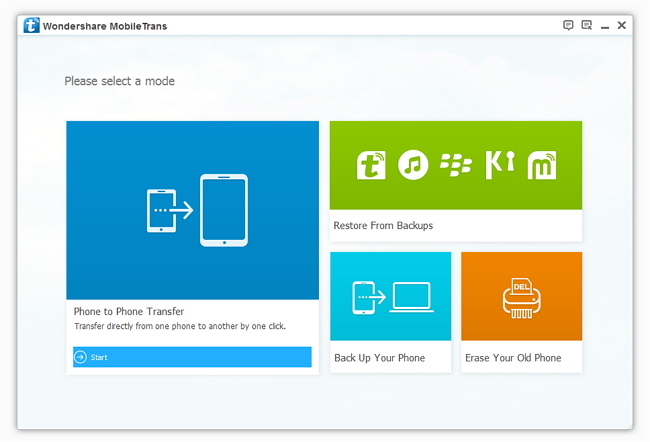 The all-in-one transfer tool – Mobile Transfer can solve all your problems, whether transfer or restore or back up data. 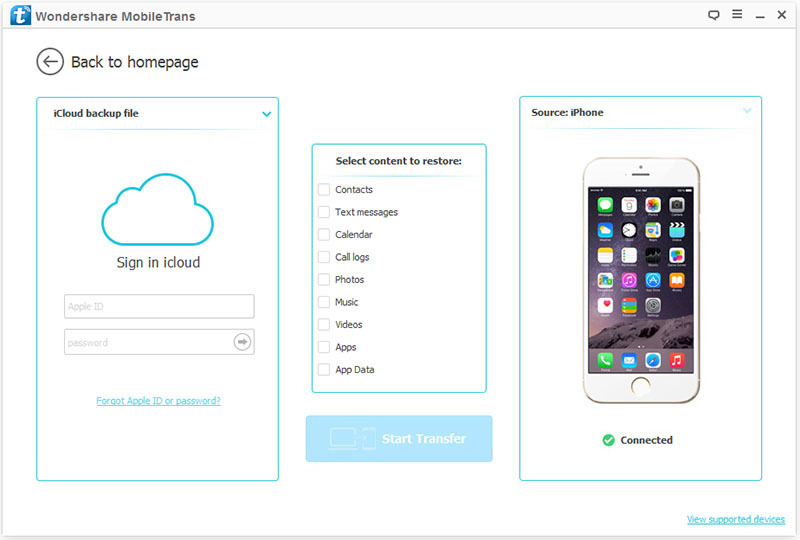 Although there are some free transfer tools in market,they still have some disadvances in some respects,such as losing some data during the process,inefficience,limitations on file type,etc.. Instead,the Mobile transfer software can satisfy all your requirements. 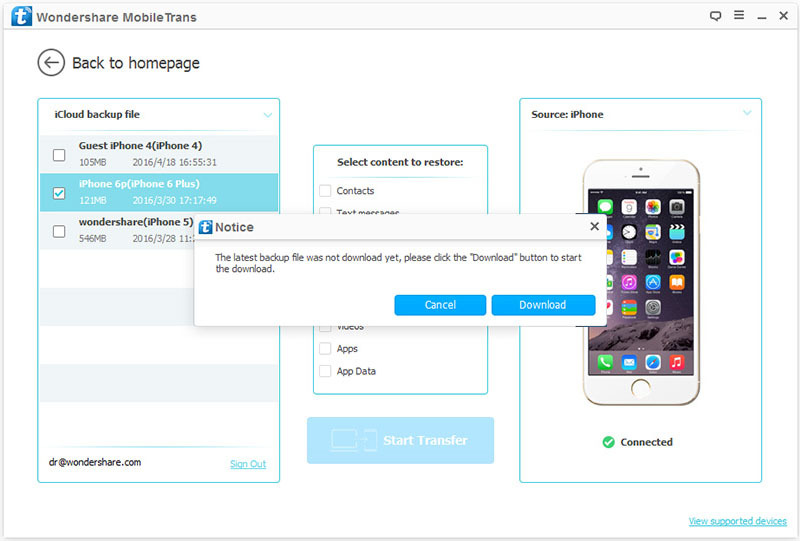 You are able to transfer whatever you like in a short time without any lost and any risk,whether calendar or photos or call logs or apps or more.Besides,it’s no complex to use this software.So now please follow my steps and have a try. Let’s take the new product iPhone 8/8 Plus as an example. Steps to transfer data from iCloud Backups to iphone 8/8 Plus. Step 1. Install the software and connect the iPhone 8/8 Plus to your computer. Above all,you are ought to concatenate the iPhone 8 to your computer with a USB line.Next,please install and launch the Mobile Transfer on your computer.Then you can see the “Restore from Backups”,click it. Step 2. Sign in with your iCloud account. In order to transfer data from iCloud Backups,please click the “Restore from Backups” > “iCloud” ,then you need to sign in with your iCloud account . Step 3. Download your iCloud backup. If you’ve entered the iCloud account, you can see all your iCloud backup files displayed. Before transfering, you need to wait for the iCloud backup to be downloaded first. It will take you a few minutes to wait, please be patient. Step 4. Transfer the file and start it. After have downloaded already, you can click the “Start Transfer”to transfer any file type from the iCloud Backups to iPhone 8/8 Plus. During it’s operating,please keep the computer and iPhone8 always connected,otherwise the process will be inefficient. Warm Tip: If you would like to replace your device’s data, you can use the “Clear data before copy” feature. This entry was posted in Phone to Phone Transfer and tagged recover iphone 8 data, transfer data from icloud backups to iphone 8, transfer data to iphone 8 on October 26, 2017 by CJlabi.